Physical independence, something many of us take for granted, can be possible for my mother Leenora. Years prior to my birth, my mother was shot and paralyzed from the neck down. At the tender age of 16, she was labeled a quadriplegic and told by doctors that she would never be able to move anything but her eyes. The doctors were wrong. With determination and resilience, Leenora eventually regained movement in her arms and legs, and bowel and bladder function. It has been a long journey and she has survived without facing the secondary complications associated with a spinal cord injury: blood clots, bed sores, respiratory problems. Leenora attributes her good health to the grace of God and a very loving, supportive and devoted family. The struggle is never ending and it takes extreme will power to meet the daily challenges that most people take for granted. 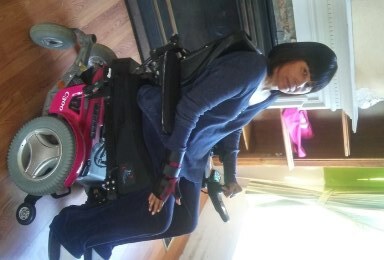 Still, my mom confronts her challenges with a fighting spirit because she is confident that she is capable of eliminating her dependency on a wheelchair. Years ago, Leenora walked with a platform walker assisted by a physical therapist. Unfortunately, budget cuts prevented future therapy sessions and derailed years of hard work and progress. Recent advances in spinal cord injury treatment are making it possible for people like my mother to regain movement and have an improved quality of life. However, to achieve this Leenora must participate in an intense physical therapy training program. The only obstacle from preventing this wish from becoming a reality is funding. Specialized therapy programs with the latest in technological advances are very expensive. For this reason, family, friends, and a host of others are volunteering to help raise funds to make my mother’s wish come true. To help with the financial burden of Leenora’s uninsured therapy expenses, a fundraising campaign in her honor has been established with HelpHOPELive, a trusted nonprofit organization that has been providing community-based fundraising guidance to patients and their families for more than 30 years. All donations are tax-deductible, are held by HelpHOPELive in the South-Atlantic Spinal Cord Injury Fund, and are administered by HelpHOPELive for illness-related expenses only. Please consider making a contribution. With your help and generosity, Leenora will be able to get the therapy she needs. Thank you so much for your consideration and support.